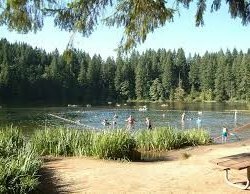 A forested camping park in the Cascade Mountain foothills; its proximity to Vancouver and Portland and its cool green lake make it a great escape from the bustle of city and suburbs. Children frolic in the shallow swim area under the watchful eyes of their picnicking parents, anglers float on the lake, hikers and campers take quiet strolls in the woods. On sunny weekends, laughter fills the playground, lakefront and kitchen areas. Whether you’ve come for a rest or a family play day, time spent at Battle Ground Lake will leave you refreshed and ready to tackle your life once again. The 280-acre park offers hiking, biking, horse trails and a primitive equestrian camping area. 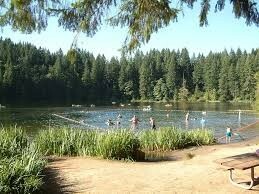 The spring-fed lake is attractive to swimmers and paddlers and is stocked with trout, making it a favorite of anglers. The park has 25 standard campsites, six hookups sites, 15 primitive sites that require campers to hike up to half a mile from the parking lot, four cabins, one RV dump station, two restrooms, and four showers. Maximum site length is 35 feet (may have limited availability). Group camp G-1 has four Adirondack (three-sided) shelters that each sleep eight people. The camp offers a covered cooking and meeting area, a group fire ring, room for 32 people in tents, and two vault toilets. Due to a small, unlevel parking area, RVs are not allowed in this camp. There is a minimum group size of 25 people. A horse camp, G-2, is available by reservation. This group camp requires that horses accompany overnight quests. Occupancy is four families. Horse camp includes four two-stall corrals or eight small corrals, one vault toilet, two fire rings, and four picnic tables. There is a minimum group size of 10. Four cabins at Battle Ground Lake sit among a grove of Douglas Fir trees. Each cabin is 12-by-24-feet in size and accommodates up to five people per cabin. Bathrooms and showers are nearby. For more information, visit our cabins and yurts page.